This is one of the best applications running on Windows OS that functioned as download accelerator, most of windows lovers are familiar with this application called Internet Download Manager abbreviated as IDM. According to the its official site, this application was able to increase your download speed up to 5 times. This application has a lot features that makes it very popular out there as download management tools. Here is a link to download Internet Download Manager and its portable apps that are updated every time a new version was released. Please subscribe to get the latest IDM update. 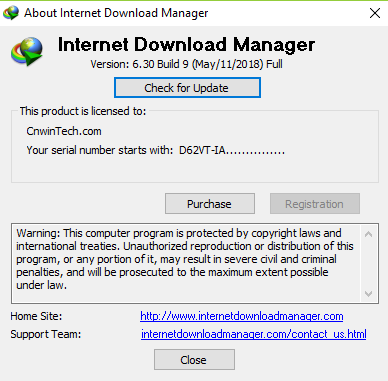 CnwinTech provide latest IDM with full installer, unlocked files, & registry files, as well as portable IDM application (pre-activated & no registration required) for Windows 32-bit & 64-bit. Delete the IEMonitor.exe file if you want or end its process first through the Task Manager from the IDM’s installation directory, this due to it runs in the background all the time as monitor and wastes the system resources.